As promised, Apple on Friday launched its iPhone 4 Case Program, granting free cases to customers who buy a phone through Sept. 30, and refunding those who already bought a protective "bumper" through an iPhone application. The website with instructions is available at apple.com/iphone/case-program/, but users must request their case through the free "iPhone 4 Case Program" application on the App Store. From there, users sign in with their iTunes Store account or Apple ID, and can choose a bumper case. iPhone 4 customers who made a purchase before July 23 must apply no later than Aug. 22, 2010. Otherwise, customers must apply within 30 days of their iPhone 4 purchase. To qualify for the program, customers must purchase their iPhone 4 by Sept. 30, 2010. 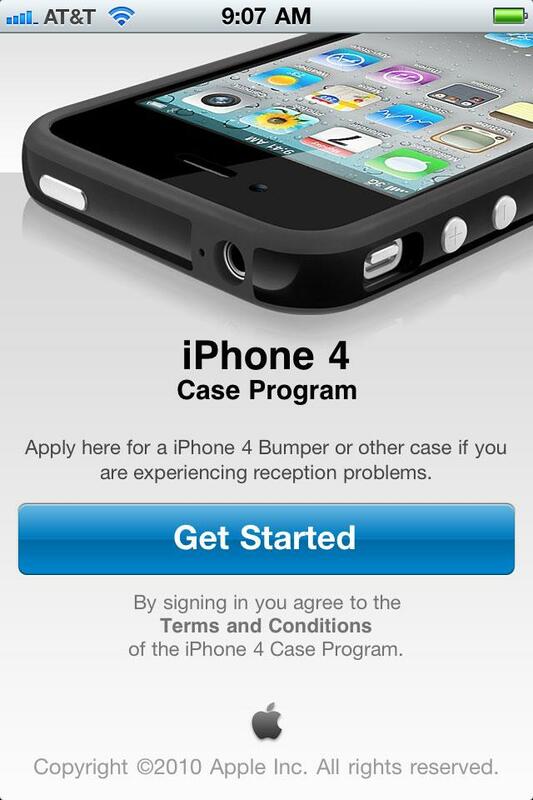 "If you are experiencing reception issues with your iPhone 4, youa re eligible to receive an iPhone 4 Bumper or other select third-party case from Apple at no charge," the application's description reads. "Download this ree app onto your iPhone 4 and apply your free bumper or case." "Only iPhone 4 owners are eligible for this program. The app will check the IMEI and serial number to verify that you have an iPhone 4. Once eligibility is confirmed, you will be able to choose an iPhone 4 bumper or other case. The bumper or case will be shipped to you at no charge." Options include a black first-party bumper, smoke or clear Incase Snap Cases, clear Belkin Shield Micra, diamonds/smoke Griffin Motif, black/black graphite Griffin Reveal Etch, black tartan Speck Fitted Case, and black Speck PixelSkin HD. All of the cases ship within 3 to 5 weeks. Apple also said that those who purchased a bumper via credit card have already been refunded automatically. Those refunds began Thursday. Apple Retail Store customers can check the status of their refund at iphonebumper.apple.com. Those who bought with cash, check or gift card at an Apple Store must return to the store with their receipt by Sept. 30, 2010 to get their refund. Customers who used a gift card on the Apple Online Store will be automatically mailed a new gift card for the refund amount. Finally, for those who bought through an AT&T store, customers will be reimbursed for the purchase price as well. A rebate coupon is available to fill out on Apple's website. The rebate form must be mailed by Sept. 30, 2010, and refunds will be sent as soon as the claim is processed. Apple's case program site also includes information on how customers can return their handset if they are not fully satisfied. "You can return your undamaged iPhone 4 to any Apple Retail Store or the Apple Online Store within 30 days of purchase for a full refund," the site reads. "If you purchased your iPhone 4 from AT&T, you can also return it to an AT&T store." The page also includes a link to Apple's newly launched antenna performance site, which explains the attenuation effect that can be experienced on the iPhone 4 and other smartphones when held improperly. Apple explained the issue and launched the site last week at its iPhone 4 press conference, when the company also revealed its free bumpers and cases program.